The ride ends. I expected the Colts to win three games this year, maybe a maximum of six if things went really well. Instead, they won 11 games and a young team has a playoff appearance under its belt. It's a down payment. The Colts had a puncher's chance against the Ravens. As good as the team has been this year, they weren't favored to win. Perhaps I became complacent in thinking that they would pull it off. The truth is that this season--which on the surface looked like a rebuilding effort--is really a down payment on the team's future. Can we get a touchdown? The Colts had a decent game in terms of moving the ball against a very good but not great Ravens defense. The Colts failed to get into the end zone--and paid the price for it. Costly mistakes. A missed field goal from a turnover, a fumble as the team drew within scoring range--these are the kinds of mistakes that lose ballgames, especially in the playoffs. Coach down. Offensive coordinator Bruce Arians couldn't make it to the game after going to the hospital for dizziness. I don't think this was a huge blow from a tactical standpoint, but it certainly would've been nice to have Arians on the sidelines as he's been all season. The Mayor delivers, again. At first, the numbers weren't great, but at the end of the game, Vick Ballard had 91 yards on 22 carries and punished the Ravens defense. Seriously, the guy lowered the boom on several defenders. And then the Mayor forgot how to use his hands. If there's one issue with Ballard, it's inconsistency in the passing game. Look, converting on fourth down wouldn't have won the game, but it could have made things interesting. I mention this because it's not the first time we've seem him drop a fairly catchable ball. While I'm on the subject of drops... The Colts had too many. Coby Fleener, Donnie Avery (what seemed like a billion times), Ballard. The Colts needed to play nearly flawlessly to go deep into the postseason. They did not. Em-Boldin-ed. Remember when Anquan Boldin was the great fantasy football receiver? It's been a while. Someone should've told him he's not a big-time receiver these days. Boldin absolutely killed the Colts and abused Cassius Vaughn on some key plays. Ray-Ray plays big. Ray Lewis played his last home game for the Ravens, finishing with 13 tackles and treating all of us to his seizure dance at the end of the game. I've made fun of Ray Lewis pretty much forever, but it'll be strange to watch a Ravens defense without him. Well, unless you watched most of Baltimore's games this season. From the Nate Nocton files. My friend Nate usually sends me a Facebook message each game with an observation of his own. This week's comment: "Why is Davis not covering Boldin?" A fair question indeed. Not able to convert. The Colts forced two Ravens turnovers, both from the usually sure-handed Ray Rice. They didn't convert either into points. I thought Indy needed a fortuitous bounce here or there to win. They got a couple...and still couldn't pull it off. Not so special. This was one of the worst performances from the punt/kick coverage units in a long, long time. Again, the Colts couldn't afford to give Baltimore anything. Old Houston Texans nemesis Jacoby Jones had himself quite a day. Big plays. Big plays. Big plays. The Ravens feasted on the big play, including a game-changing 47-yard screen pass to Ray Rice and a 50-yard pass to Anquan Boldin. On a third and 18 deep in Ravens territory, Joe Flacco hit Boldin for another huge completion. It's a weird game. The Colts controlled the clock, rushed for 152 yards, and ran 31 more plays than the Ravens yet lost the game. How does that happen? See previous entry. The Ravens averaged 11+ yards per pass, too. Keeping it close. After the Ravens went up 10-3 just before the half, the Colts mustered a field goal with less than a minute left. They overcame an intentional grounding call with a big-time throw and catch involving Andrew Luck and T.Y. Hilton. After Ray Rice's second fumble, the Colts had a pulse. They didn't roll over. Reggie Wayne. Reggie Wayne capped off a fantastic season with nine catches for 114 yards. Every time the team needed him, he stepped up. That's it for the season. 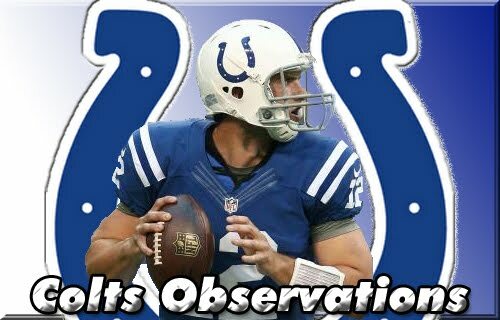 As the Colts bow out of the playoffs, Colts Observations also come to an end. What an amazing season!